Giving up meat can be easier than you think. You might be surprised how little you miss the taste, and how much more you enjoy the other things you taste now that the flavour of the meat isn't overpowering the meal. But someone people miss the texture of meat. There is something about having something you can really get your teeth into in a meal. If you miss the texture of meat but still want to stick to an animal free diet, have a look for these vegetarian alternatives. Tofu is a well know vegetarian protein that's commonly used. It comes from soya bean curd. It can come very soft, or it can come in drier chunks which are sometimes marinated or smoked to add flavour. It works well in stir fries but can also be added to other dishes. Being soya based it's a very healthy protein but for someone who's craving that meat texture it's probably not the best alternative. Many manufacturers use Quorn™ as a meat alternative, and as the name is trademarked, it will always be clearly visible on any packaging. The protein comes from a branch of the mushroom family. It is possible to buy Quorn™ mince, which has a good texture for adding to chillis, curries and casseroles. It adopts the flavour of the food it's being cooked with, but also comes with flavours added if you fancy ham or chicken type slices in a sandwich. You can even get it as a bacon substitute. Some sausages and burgers are also made from Quorn™. It is also available in chunks for cooking in stir fries or other dishes. VegeMince, like Quorn is great in curries and chillis because it takes on the flavour of the dish. It's made from soya protein and wheat and usually comes frozen. It's pre-cooked with flavours and will absorb lots of juice so goes great in stews. If you're craving a good lasagne, shepherds pie, cottage pie, bolognaise or chilli, the texture of VegeMince is very similar to meat mince so makes a great alternative. The manufacturers also make VegeBacon and VegeSteak for those who really miss the meat experience. Another kind of meat alternative is Textured Vegetable Protein, or TVP, sometimes called soya mince. It is usually a dry product which is available in mince, chunks or even flakes. It doesn't have much flavour on its own, so needs to be added to something with plenty of flavour to absorb. The texture is good, but because it comes dry it needs to be rehydrated in water before it is added to the dish. 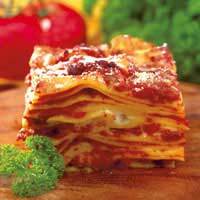 It also works in lasagne, bolognaise or chilli type dishes. There are a few varieties of vegetarian bacon on the market, but there are other options if you're looking for a snack, or miss the meat based junk food experience. Although you can't really find a vegetarian alternative for a chicken drumstick it is possible to buy all manner of vegetarian sausage and burgers. Some are given a meaty taste while others are more vegetable based. If you miss fish fingers it is even possible to get a veggie 'finger' which is breadcrumb covered. These days you can even buy the equivalent of a chicken kiev made from mushroom instead. In fact almost all dishes today have their vegetarian equivalent and many manufacturers are constantly researching and improving their recipes to ensure they taste and look just as good as the real thing. For example Thai style fish cakes are now available as a veggie option made from chickpeas. People think going meat free is a challenge that requires you to go without, but it's simply not true today. If you love it as a meat eater, chances are you can find a great vegetarian alternative.